Kurt did the interiors and designed the fabrics for this new prototype in the High Desert near Joshua Tree. Retro swinging colors were used when Kurt was tapped to remodel a midcentry Los Angeles suburban home. The clients wanted an open concept kitchen that flowed effortlessly from dining to living. Kurt reconfigured the kitchen for optimal use. He created a peninsula worktop/bar at the more casual end of the kitchen for friends to gather. Custom designed wallpaper in sunny shades or tangerine, citron and periwinkle the cover the lower half of the kitchen wall. Coordinating vinyl decals in the same colorway were created to wrap appliances and translucent glass storage cabinets. 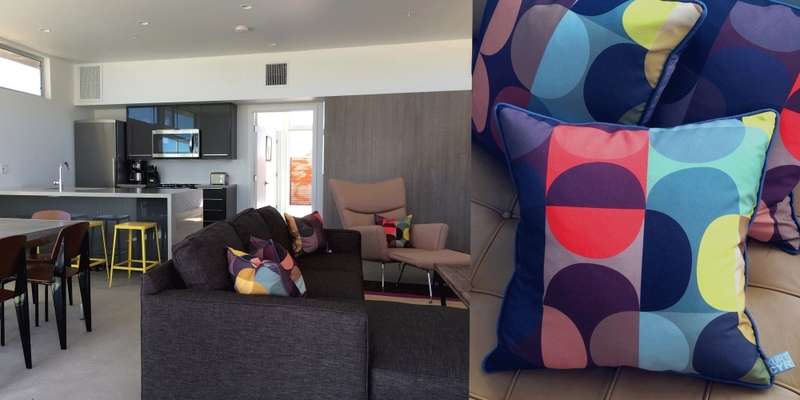 Dusty mid century hues punctuated with a shock of hot coral and black create a graphic pattern for upholstery. Backgammon is available in three colorways - dusty rose, vapor and chalky chartreuse. The Lana chair is shown in Backgammon - dusty rose. The three pattern sizes were used in its upholstery. Weathered by water, wind and time, the soft tones of the stones pave this pattern with an ever so vintage feel. Available in five different sizes ranging from monolith to pebble. Poolside is a collection of prints inspired by Palm Springs poolside life. Pool Party is a bevy of bathing beauties enjoying the waters. Brise Soleil Collection is a series of three different stylish block patterns that can be used as pillow covers and Shimmering Pool is the perfect background for upholstery. A swinging mod design recalls the madding disco bound crowds of the 1970's. The pattern works particularly well when printed on faux suede. Here it upholsters a pair of rescued pedestal swivel club chairs. Inspired by Kurt's childhood love of licorice, Allsorts hearken back to the cut glass bowl in his grandmother's living room filled with the colorful candy. A confetti bright mix of pink, yellow and orange with bits of black is a reminder of childhood. The phases of the moon inspired this collection. Imagine a mid-mod moon shining down upon a 1957 Buick convertible at a suburban drive-in theatre. Lunar is available in three sizes and five colorways. Pillows left - right: Moonshadows small, Moonshadows small, Moonshadows large. Background: Moonshadows large . Created for a Palm Springs client who collects exotic desert plants, this series of prints was inspired by the brilliant desert flora tempered with the wind swept dusty neutrals of sand and stone. Pillows left - right: Sunset, Desert Rose, Mesquite smoked. Background: Mesquite smoked. Kurt has designed a collection of modern holiday ornaments. The Cul de Sac collection is inspired by the mid century neighborhoods in Palm Springs. The Mad for Modern collection feature mid century moments for the holiday tree. Kurt is inspired by what he experiences. A walk through the Palm Springs neighborhoods of mid century modern architecture was the beginning of his holiday ornament collections. The Cul de Sac Collection captures a variety of homes that Kurt sees daily in Palm Springs tucked away on side streets and cul de sacs throughout the city. The Mad for Modern Collection of ornaments are moments frozen in time; a chair with lamp, a view through a window, these modern tableaux capture the essence of modern life in Palm Springs. This mid century modern vibe has come to the fore in his work since his move to the desert in 2009. Kurt also puts his designing abilities into graphics. He creates greeting and business cards. He has designed a line of cards for Modernism Week Palm Springs that feature iconic local architecture. He also is called upon to create branding and graphics packages for companies looking for stylish, modern identities.